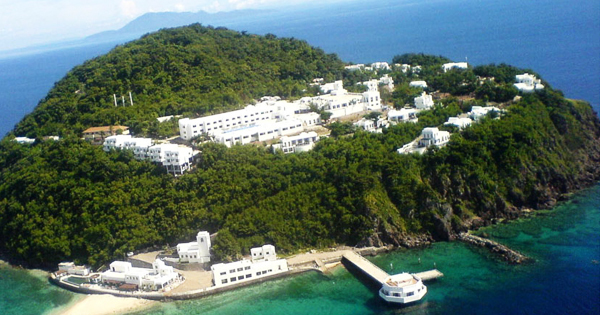 Bellarocca Island Resort & Spa, located in Marinduque, Philippines, is dubbed as the heart of the country due to its heart shape and that fact that its situated on the southeastern part of Luzon and Mindoro Islands. Its also surrounded by crystal clear ocean water -- absolutely the nation's center! #1 - Greek-inspired architecture: Have you ever been to the beautiful Greek island called Santorini? Well, yes, or no, there is a similar island like this in the Philippines called Bellarocca Island Resort & Spa! Santorini Island is a product of a volcanic eruption in Greece about 3,600 years ago actually, and it is now inhabited by about 16,000 people or so. Like the Santorini Island, the hotel is also surrounded by a charming azure blue sea that would match an awesome cloudless sky. Both also have a mountainous terrain with greenery all around and perpetual white buildings that stand so amazingly attractive in their midst... just divine! #2 - Luxury accommodations: Be cradled to the utmost relaxation with the resort's luxurious rooms that provide unprecedented comfort and amenities! Bask in heavenly sleep on their soft bed and pillows, in addition to their oh-so-cool air conditioning; reconnect with friends/families with their Skype-enabled Belkin telephone; not to mention chill with your loved ones as you view the sky plus the sea in their private balcony; also enjoy a nice warm bath in their modern bathroom with Jacuzzi, etc. etc. Don't you just want to live there forever?! #3 - Beautiful beachfront: If you are in the mood for some exciting activities, this spectacular island offers kayaking, jet skiing, banana boat riding, windsurfing, hobie cat sailing, fitness walking and jogging. On top of that, for couples who would like to have a romantic breakfast by the beach, their staff is more than willing to arrange it for them for that most memorable morning bonding! #4 - Other natural wonders to see: Not only will you be mesmerized by Bellaroca Island Resort's bright blue waters, mostly cloudy skies, excellent service/rooms and engaging activities -- you will revel in its relaxing hot springs, pristine waterfalls, ancient caves and rich marine life, too! What more can you ask for? #5 - Get there in style: Marinduque, the province where the resort is, can be reached via a mere 30-minute plane ride from Manila. From mainland Marinduque, their staff will then pick up the guests for a van transfer to Lipata town, in the municipality of Buenavista, where Bellaroca is. Finally, these tourists will ride their speedboat or yacht for just about 5 minutes to this stunning island.